According to the scriptures the Śiva Liṅgas are divided into the following categories. Udbhūta (or) Svayambhū, Daivika, Mānuṣa and Gāṇava are the four divisions. The definitions including that of ārṣa is also given there. The self-born liṅga is called as Svayambhuva, and the liṅgas created by the Devas are called as Daivikas. Those which are chiselled by the mortals are Mānuṣas and by sages are ārṣas. The liṅgas that are worshipped by Gaṇas are called Gāṇavas. Kāmikāgama adds Bāṇaliṅga to the above categories and makes the division as six. The Bāṇaliṅga is said to be cultivated by lord śiva. Further Mānasāra explains the colours of the liṅgas. Svyambhuva liṅga is white in colour and daivika liṅga is Red colour. Mānuṣa is in yellow colour and Gāṇava is black in colour. Ārṣa liṅga will have brahmasūtra on it and will be in svastika shape. The shape is defined for Daivika as “दैविकं डिण्डिमाकारं” – Daivika will be like a small drum. 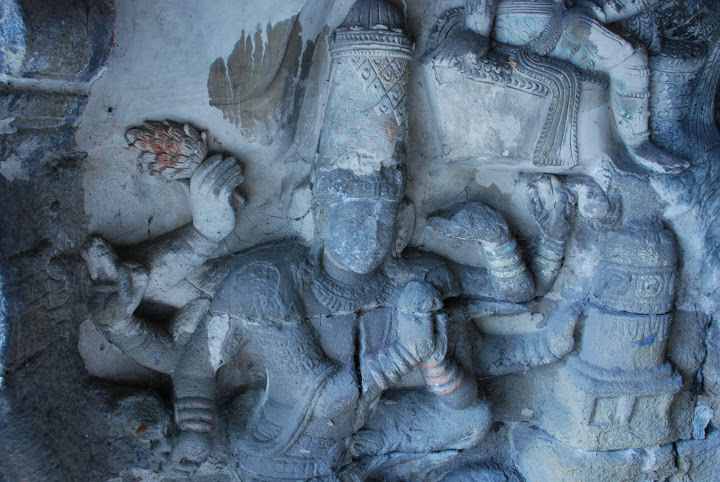 Keeping the other definitions, Now we can see the Liṅga that is depicted in the Cakradānamūrti panel of Airāvateśvara temple, Kāñcīpuram. The Aṣṭa bhuja viṣṇu is here worshipping a Liṅga to get the Cakra from him. The Liṅga has a Nāgara pīṭha and a Vesara or Vṛtta Liṅga is above the pīṭha. The Liṅga has a ūrdhva kṣepaṇa above the Pīṭha and Mālās and Vartulākāra cihnas decorate the above portion. The edge is like Aṇḍākāra (egg-shaped). The whole shape looks like a ḍiṇḍima (small drum) and thus follows the definition of a Daivika liṅga. Iconography Arsha, Daivika, Ganava. 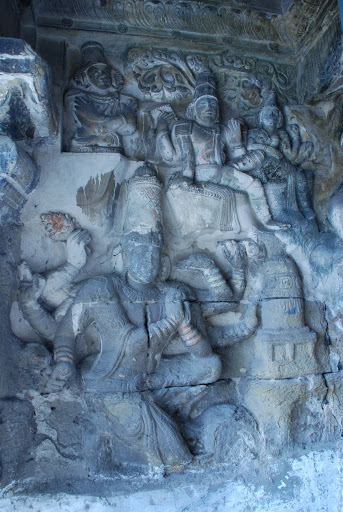 Banalinga, Linga, Pallava, Rajasimha, Siva Linga, Svyambhu. permalink.